President Barack Obama signed an executive order declaring a national emergency with respect to Venezuela and imposing sanctions on seven officials there in response to the country's deteriorating human rights climate, the White House said Monday. The White House said the decision to impose the executive order was a response to "the unusual and extraordinary threat to the national security and foreign policy of the United States posed by" the South American country. Venezuela's economy is in shambles and the country's president, Nicolas Maduro, has sparked protests for locking up opposition leaders. Maduro also recently drew U.S. ire for saying his government had captured Americans — including a pilot — involved in espionage activities, and that U.S. citizens in the future will have to seek visas to come to the OPEC nation. The White House on Monday called on Venezuela's government to release all political prisoners, saying the only way to solve the nation's problems is through "real dialogue" — not detaining opponents or attempting to silence critics. "We are deeply concerned by the Venezuelan government's efforts to escalate intimidation of its political opponents," the White House said in a statement. 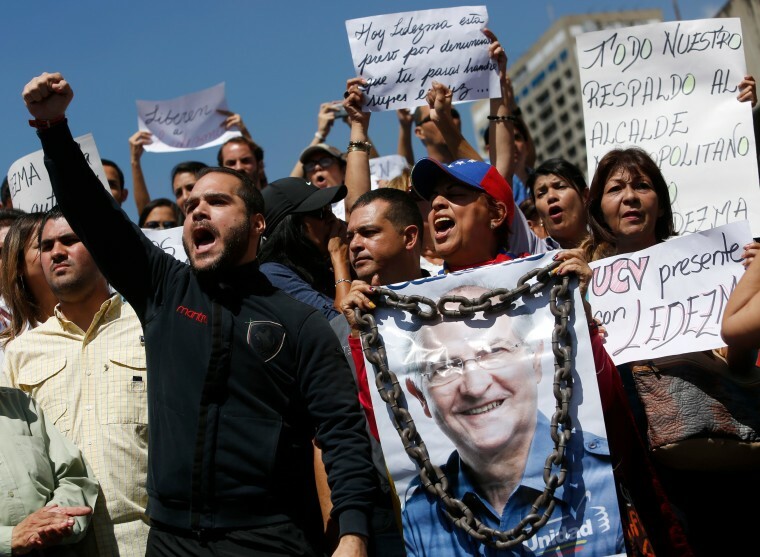 "Venezuela's problems cannot be solved by criminalizing dissent." It accused the Venezuelan government of "trying to distract from its own actions" by blaming the U.S. for events within its border, saying that approach reflects "a lack of seriousness on the part of the Venezuelan government to deal with the grave situation it faces." The executive order imposes sanctions on seven Venezuelan officials — including the director general of the country's national intelligence service, a national prosecutor in the public ministry, the director of the national police and the inspector general of the Venezuelan national armed forces. "Venezuelan officials past and present who violate the human rights of Venezuelan citizens and engage in acts of public corruption will not be welcome here, and we now have the tools to block their assets and their use of U.S. financial systems," the White House said in a statement. U.S. Treasury Secretary Jacob Lew said in a statement that the executive order and its sanctions also were intended to protect the U.S. financial system from "the illicit financial flows from public corruption in Venezuela." "We will use these tools to target those persons involved in violence against anti-government protesters, or serious human rights abuses and those involved in the arrest and prosecution of individuals for their legitimate exercise of free speech," Lew said in a statement.